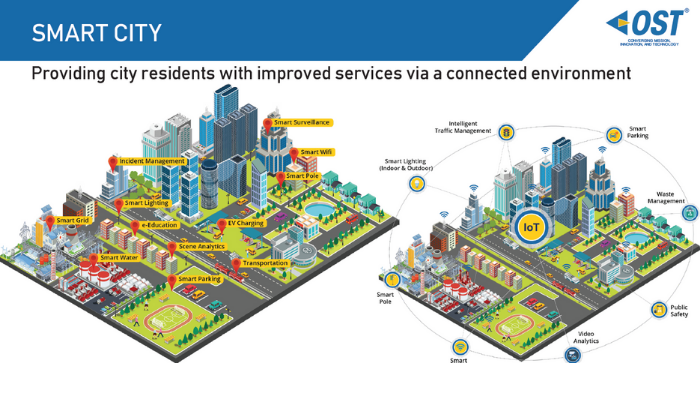 By 2030, every metropolitan city will be a “Smart City”, with improved services, new business models, and a connected environment. This will be achieved through the Internet of Things (IoT) and digitally transformed infrastructure including energy, transportation, public safety, and more. As a Smart Infrastructure systems integrator, OST helps authorities to deliver higher-quality services and revenue generation. We also provide Public Private Partnership (P3) financing solutions that will cover 100 percent of up-front costs for each project. Upgrade to Smart LED lighting and utilize IoT platform to manage maintenance and outages of lights, reducing costs while optimizing resources. Integrate advanced sensor technology to alert authorities to pick up trash and specialized equipment to assist in easy pick up, reducing costs, improving scheduling/routing, and optimizing waste pick up. Provide infrastructure for Smart Lighting, Smart Cameras, Wi-Fi, digital signage for public information, charging stations for electric vehicles, and additional environmental sensors. Improves emergency alerts and monitors and controls carbon levels, noise levels, gas leakages, waste levels, etc. Monitor traffic flow and incidents using smart sensors on roads and highways, proving real time alerts to citizens. Enforce parking ordinances using cameras and sensors with real time occupancy information and incident alerts. Mobile app assists drivers in finding available spots easily. Saving drivers time and cost while offering cities the opportunity to generate additional revenue through flexible pricing strategies based on demand. Leverages machine learning, pattern recognition, and behavioral knowledge to identify relevant video footage. Adaptive video anomaly detection spots unexpected changes in video images over time. Provides a secure communication platform with NextGen911 features that integrates portable vehicle and cargo scanners.